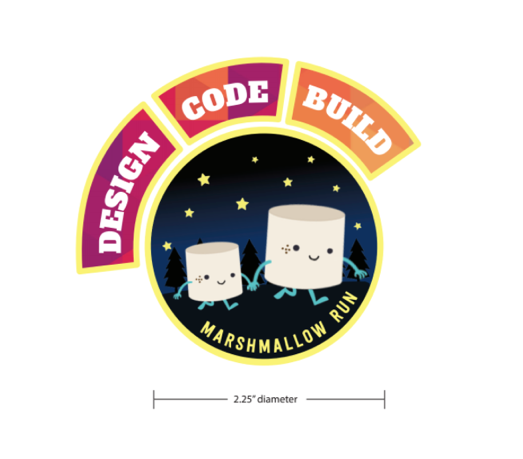 Round “Marshmallow Run” night scene patch: earned by one participation in any program or workshop. “Design” Patch: Opt into the Design track at one of our summer camps, or into an after-school Design program this fall (5 meetings of 2 hours each) to earn this patch. “Build” Patch: Opt into the Level Creation track at one of our summer camps, or into a Level Creation program after school this fall (once a week for 2 hours, for 5 weeks) to complete a game level. “Build” Patch: Marketing: help us tell the story to the media – we show participating Girl Scouts how to create convincing social media posts, video clips, press releases and even banner ads to get the word out about the game once we launch. Also, if we get to go to any conventions, you will get to help with logistics like booth and exhibit design.